If you've been following this blog, and reading for some time, you may have seen a post from January. This post is an introduction to the gut-brain connection and how our diet can affect our mental health. Today I'm going to give you a couple simple recipes to help start your path to healing your gut. 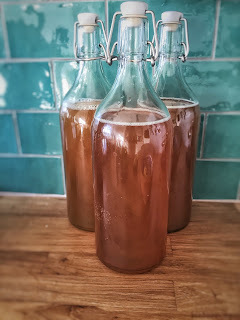 I've devoted an entire post to Kombucha in the past, and might do so again in the future. Kombucha is amazing, both for your gut and for the taste. If you want to get more of the nitty-gritty details, please feel free to look up that post I made last September. In the meantime, I wanted to give you a great recipe for flavored Kombucha that goes a step further than just plain. This particular one adds in a few ingredients that are also super healthy for your gut. Bring the water to a boil. Remove from heat and stir in the sugar until it has dissolved. Now add in the tea bags. Cover, and let cool to room temperature. Once mixture has cooled, remove the tea bags and add in your starter Kombucha. Pour into your fermentation container (I use a gallon Mason Jar) and add in your SCOBY. Cover with cloth and secure with a rubber band. Let sit, out of direct sunlight, for 5-7 days (here in Central Florida, I start tasting at 3 days during the summer). When it tastes pleasant to you, remove the SCOBY and 1 ½ cups of starter, place them in a holding container (bowl or another jar). Now add in your berries and ginger. Cover with cloth and allow to sit at room temperature, out of sunlight, for an additional 2 or more days. Taste the brew and when you are happy with it, go ahead and strain out the herb/fruit solids. Pour the Kombucha into bottles and enjoy! Adding chia seeds to your Kombucha is a great way to boost your energy levels and help with your gut issues. However, some people are sensitive to small seeds so use caution if you have certain gut issues like diverticulitis. Add Chia to Your Kombucha! Place chia seeds and gel into a cup or bottle. Add in Kombucha. Stir (or shake) well. Enjoy! Recently, bone broth has received quite a bit of attention. Which is awesome, because it's been so underrated for years. Bone broth is similar to a typical broth or stock, except you simmer the bones for 48-72 hours in order to break down the marrow and release all those healing minerals. It's this that makes bone broth so amazing for you. For optimal gut health, consuming a minimum of ½ cup every day will help to repair/rebuild the barrier of your gut and help increase nutrient absorption. I like to freeze my broth in ice-cube trays. This makes it easier to add them to rice, quinoa, soups, salad dressing, and so much more. Wellness Mama has written up a great introduction to bone broths, including where to find bones and how to use the broth. *Optional* Roast the bones, in a 350° oven for 30 minutes, to improve the flavor. 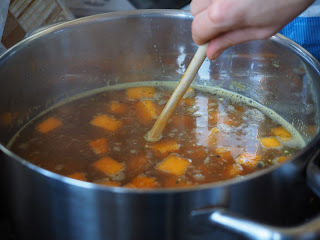 Place the bones in a stock pot and cover with water. Add in the vinegar and let sit for about 45 minutes. This helps the minerals to begin coming out of the bones. While you are waiting on the bones, chop 1 onion, 1 carrot, and 1 celery stalk. Sautee these vegetables with the coconut oil, until onions are translucent. Add them and the remaining onion, carrot, and celery (chopped) to the stock pot. Now is the time to add your salt, pepper, carrot tops, and any other herbs you would like to add (except the garlic and parsley). If needed, add water to just cover all the vegetables. Bring contents to a boil. Once it has reached a roiling boil, reduce heat to simmer. Simmer for 48-72 hours. During the first few hours, scum will form on the top of the broth. Skim that off and keep simmering. If you're not comfortable leaving the stove on over night, turn it off (make sure it's covered) and let it sit at room temperature over night. Turn it back on the next day and simmer away. You can also make this in a crock pot. During the last 30 minutes of simmering, add in the parsley and garlic. When your time is up, remove it from the heat and let the broth come to room temperature. Strain out all solids and enjoy! This will keep in the refrigerator for 5 days. I always freeze ½ of my batches for later use. Both of these recipes are very versatile. You can flavor the Kombucha however you want, with or without chia seeds. You can use the bone broth as a base for every soup, to cook rice/quinoa, or to add in place of water with any savory dish you are cooking. Not only will they help to boost your gut, but they all work to boost immunity, mood, and overall health. 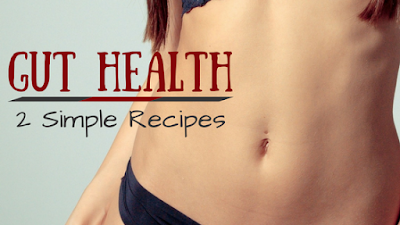 I have previously posted some other recipes that are great for gut health. Fermented Lemons, Golden Milk, and Fermented Salsa are all great recipes to add into your diet to boost gut health. I hope you enjoy making these recipes, and I hope they help you on your journey to better gut health! If you have any questions or comments, please leave them below!